NAHB strives to protect the American Dream of housing opportunities for all, while working to achieve professional success for its members who build communities, create jobs and strengthen the nation's economy. Fighting for housing on major policy issues, providing excellent educational programming, and creating outstanding networking opportunities are just some of the ways that NAHB fulfills that mandate. And the proof of its success is in the numbers. 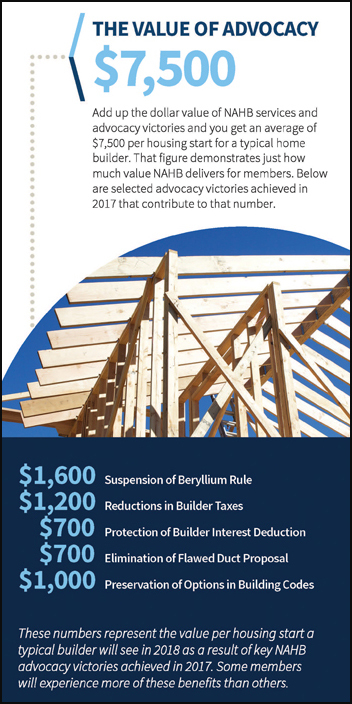 NAHB members will save a total of about $7,500 per housing start in 2018 due to NAHB's advocacy efforts in 2017 and other member benefits. NAHB urges members to take full advantage of the many resources that it offers. They are designed to help members build a better home, build a better business and work in a more positive business environment.